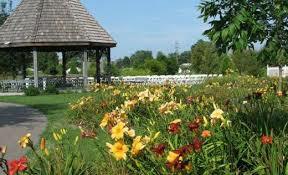 Thank you for considering the Western Kentucky Botanical Garden to host your event. We will do everything we can to make it a success. 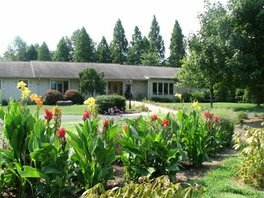 You can rent the entire Garden or any part for receptions, weddings, dinners, luncheons, meetings, reunions, parties, retreats and fundraisers. See below for details and rental options. The Cottage In The Garden: During 2004 each room in the lovely building was tastefully and beautifully decorated by local interior designers. The entire house can be used for your event or each room/suite can be rented separately. In the winter months the maximum number of people that can be in the house is 65. In other seasons when you can utilize the beautiful patio overlooking the garden, more people can be accommodated. 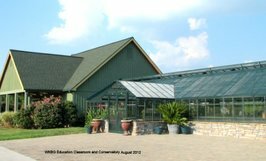 Educational Building: This building is located in the back of the Garden and consists of a classroom, lobby, and restrooms. The building may be rented in its entirety or each area may be rented separately. This area is ideal for meetings or educational programs. The lobby/restroom areas are commonly rented along with wedding party rentals for access of the restrooms for party guests. The classroom seating capacity is 24-36. Magnolia Suite: The Magnolia Suite consists of a large room (Magnolia Room) with a great view of the Japanese Garden as well as an adjoining room, separate bathroom and private outside entrance. This outside entrance provides easy access to the Patio and Garden. This suite is ideal for small business meetings, dinners, luncheons, and as dressing rooms/staging areas for outdoor weddings. Seated capacity is 18-24 in the Magnolia Room. Garden Suite: The Garden Suite consists of the Daylily room with entry to the patio and the Foxglove room adjoining the kitchen. The kitchen is included as well. This area is ideal for receptions, dinners, retreats, luncheons, business meetings and weddings. 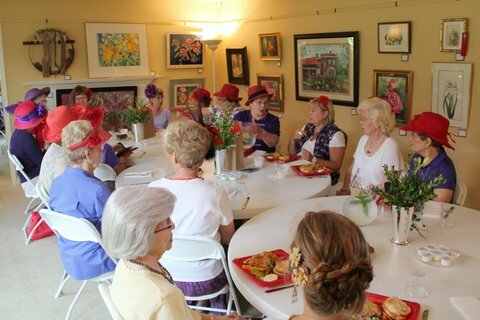 Seated capacity in the Daylily room is 24-48, and the Foxglove room is 16-18. Tent: The Garden has a tent that can be rented. The Tent measures 20 feet by 30 feet and is white with sides. The use of the tent is very versatile and is excellent for weddings, receptions, outdoor luncheons, business gatherings, reunions, parties, etc. It’s a great accompaniment for the Patio or Vora Gazebo. The Vora Gazebo: The lovely Vora Gazebo is located in the Garden between the Herb and the Daylily Garden and nearby the Orchard. It has a great view of the Garden and is generously sized. The Vora Gazebo is excellent for weddings, receptions, small luncheons, parties and other events. Forget-me-not Room: This is a small, private room that can accommodate seated, 8-12 people. This is an ideal setting for a small luncheon, meeting room, or breakout room.8. The Patio: The patio is a covered area accessed through the Daylily room as well as from the Garden grounds and Magnolia room, in the cottage. It affords wonderful views of the Japanese Garden and easy access to The Garden. The patio is commonly rented along with the Garden Suite, yet it may be rented individually. 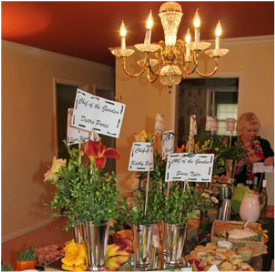 This area is ideal for small parties, receptions, dinner, luncheon, or baby/wedding showers. Seated capacity for the patio is 24-32.
in-house catering or provide arrangements with an outside caterer.